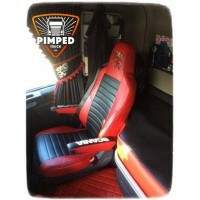 Pimped Truck LTD selling high quality Truck Accessories for an extensive range of makes and models of lorries. 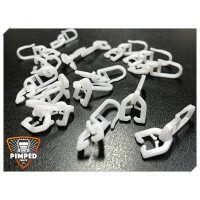 Our product will make your travelling easier, more comfortable and will transform your cabin into a more aesthetic and practical environment. 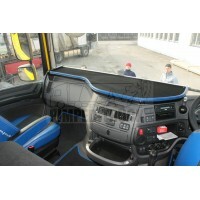 DAF 106 XF Large Truck tables are high quality durable wooden tables with nickel finish and black ca..
Mercedes Actros MP4 centre with drawer Truck tables are high quality durable wooden tables with nick.. 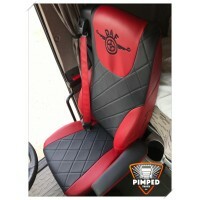 The seats covers are made in full from ECO Leather, which is very easy to keep clean and looking bri..
Scania S-series left (passenger side) Truck tables are high quality durable wooden tables with nicke..
Scania S-series centre Truck tables are high quality durable wooden tables with nickel finish and bl..
Scania S-series Large With Drawer Truck tables are high quality durable wooden tables with nickel fi.. 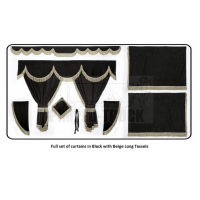 The Central part is made from high quality material, specially designed to allow free air circulatio..
FULL SET INCLUDES:- front & site curtains- curtains behind seats- pelmet- tiebacks- pillow- hook..